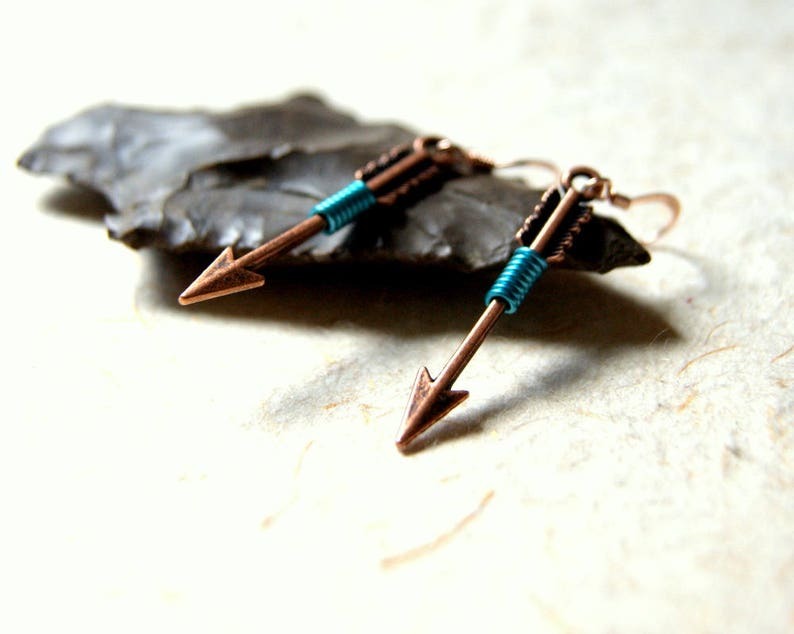 Arrow earrings comprised of antiqued copper arrows, wrapped with turquoise blue wire and hung from rose gold filled french earwires. New to my collection of arrow jewelry. I will be listing more colors. Meanwhile, if you like these but don't like the turquoise wire, browse my arrow jewelry section in the shop to see what other colored wire I offer. Leave a message when you check out telling me what color wire you'd prefer. Perfect for the hunter, archer or woodland fashionista. Many of my earrings can be converted to Clip Ons, free of charge. I have silver plated, oxidized silver plated, gold plated, antiqued brass and bronze with a coppery finish. Contact me on Etsy BEFORE making your purchase to see if the earrings in question can be converted to clips.